Ireland kicked off their autumn global series with a resounding 54-7 win over Italy. Full-back Larmour, making his first Test start, scored three of Ireland's eight tries, with Tadhg Beirne also crossing twice for the Six Nations champions. Munster Rugby lock Tadhg Beirne also got in on the act in the U.S., scoring his first two tries for his country either side of half-time. 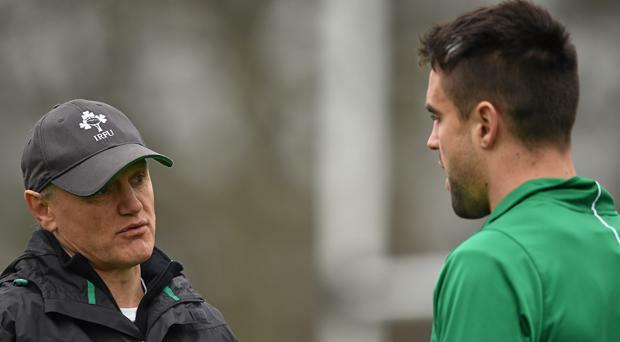 Ireland head coach Joe Schmidt described Larmour's performance as a "spectacular effort". Ireland were only 14-7 up at the break after Campagnaro got the Azzurri on the board by intercepting a loose pass from Ruddock and coasting in for a gift of a try. "We knew we wanted to pick up the tempo in the second half", Ireland captain Ruddock said. Carbery maintained his flawless record from the tee by adding both conversions and the Munster out-half was on target again after 56 minutes when Sean Cronin scored off a powerful maul. The quickfire double saw the Italian heads drop and Sean Cronin ran in Ireland's fifth try before the hour mark from a handsome rolling maul, with Carbery kicking a tricky conversion to make it 35-7. Ulster Rugby centre Will Addison and Leinster fly-half Ross Byrne both made their global debuts for Ireland off the bench, with the latter slotting over two late conversions. This was a day that belonged to Larmour, though, and after Ringrose scored a lovely try when he linked with Bundee Aki, the Leinster full-back stole the show in the dying stages.